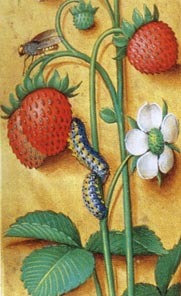 Medieval recipes for summer fruit are rare. Strawberries, raspberries, brambles, blue- and blackberries: they were mostly eaten as we like to eat them, ‘straight from the bush’. Of course you do not need a recipe for that. According to the medieval health regime the eating of raw fruit was dangerous: in humoral pathology fruit was determined by the qualities cold and dry, which is exactly the opposite of the ideal quality of the healthy human body, being warm and moist. These noxious qualities of fresh fruit could be compensated by boiling the fruit, a procedure which adds warmth as well as moisture. There are for example countless recipes for applesauce. So, from the medieval point of view, this strawberry pudding could be eaten with a clear conscience, because the strawberries are cooked. The strawberries we eat today are varieties from American (North and South) strawberries. These were introduced in Europe in the seventeenth century. 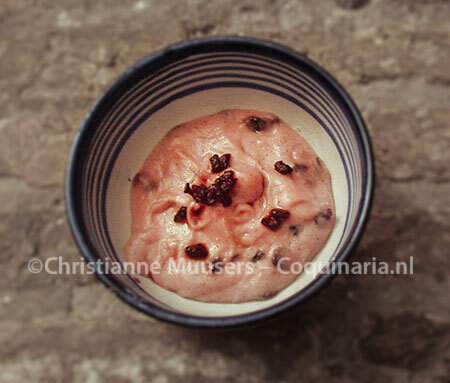 If you want to make an authentic medieval dish you should use small European wood strawberries. They are difficult to find and rather expensive once you have found them. I tried to find some wood strawberry plants in garden homes to grow in my garden, but even there they are difficult to find. At least, in the Netherlands. The recipe comes from an English manuscript from the first half of the fifteenth century, Harleian ms.279. This cookbook was published by Thomas Austin in 1888 (see bibliography, the recipe is nr 123 on p.29). This manuscript not only contains recipes, but also menus of a number of official banquets. Some of these banquets are described in contemporary chronicles. Austin mentions these descriptions in his introduction to the edition. Other recipes from this manuscript: apple fritters, and ‘hedgehog’. In rendering the original Middle English text I have silently changed thorn (þ) en yogh (3) in th and y (at the end of a word the yough or yogh can also be rendered by gh). This has no effect on the meaning of the words. Strawberry. Take strawberries and wash them when in season in good red wine. Then strain through a cloth and do them in a pot with good almond milk. Bind it with amylum or with rice flour, and make it stiff and let it boil, and put currants in it, saffron, pepper, a lot of sugar, ginger powder, cinnamon, galingale. Finish it off with vinegar, and a little white grease added. Colour it with alkanet and transfer it [to a bowl](? ), sprinkle with the grains of pomegranate, and then serve it. Dessert for 6 persons (very filling); preparation in advance 30 minutes; preparation 7 minutes + cooling. Make almond milk. Steep the ground almonds in 250 to 300 cc hot water, then strain them through a cloth. To obtain more milk you can squeeze the cloth gently. You should get about 200 cc almond milk. Clean the strawberries: Hull the strawberries (in Dutch the green tufts are called “coronets” -strawberries are called zomerkoninkjes, little summer kings-, please let me know if there is a similar English term). Rinse the strawberries shortly under cold running water, then steep them for 15 minutes in red wine. Discard the wine or try drinking it (after straining it through a fine cloth or paper kitchen towels). It is not bad. Make the pudding. Put the strawberry pulp in a skillet with the almond milk, rice flour, sugar and spices. Bring to the boil, let simmer for a couple of minutes. Pull it off the fire when the mixture starts to bind. Add butter or suet, then add vinegar and currants. The pudding is probably very pink, but if you like it even “pinker”, add some red food colouring. If you think the pudding is not stiff enough you can add some cornflour mixed with a little water. Pour the pudding in a large bowl or in small individual bowls. Sprinkle just before serving with the seeds of pomegranate. 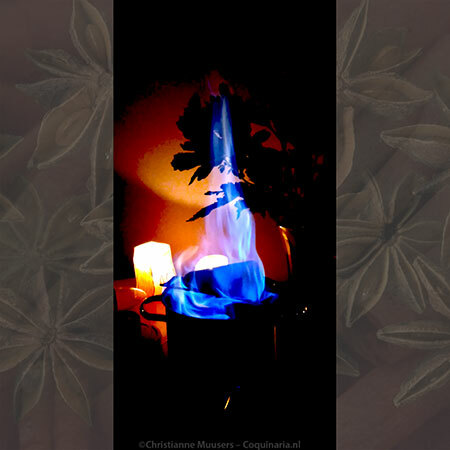 When using dried seeds (which is what the medieval English cook probably did anyway), steep them a couple of minutes in hot water (you can also steep them first, and use the red water for the almond milk). Serve the pudding at room temperature, or slightly chilled. You could use this pudding as stuffing in a fruitpie. Bake one large sweet pastryshell or a number of small ones, and pour the strawberry pudding in. Let it cool, garnish with slices of fresh strawberries and pomegranate seeds. Or try using a strawberry jelly mould. First dress the mould in thin kitchen foil, then pour in the pudding. On this page of Edgewater Manor you find a description of a strawberry pudding that is taken from the Forme of Curye (C.B. Hieatt and S. Buttler, Curye on Inglish, 1985). 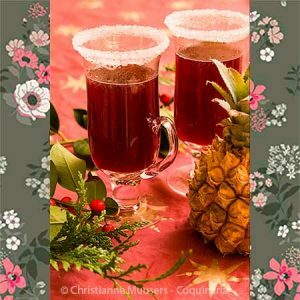 Main differences: ‘my’ recipe specifies that the wine must be red, and it uses sugar where ‘their’ recipe does not specify the colour of the wine. Moreover, ‘my’ recipe uses almond milk in addition to rice flour, and adds cinnamon. Een plantaardige kleurstof afkomstig van de wortels van aan bernagie verwante planten. Alkanet werd al door de Arabieren gebruikt om stoffen en voedsel te kleuren. Wordt nog steeds gebruikt in een aantal levensmiddelen. De Alpinia galanga (grote galanga) en Alpinia officinarum (kleine galanga of laos) komen uit Zuid-China. Die laatste heeft een sterkere smaak. Laos is de Indonesische naam van deze specerij, en in Nederland is dat dan ook de naam waaronder galanga vooral bekend is. In de middeleeuwse keuken werd deze specerij vaak gebruikt. Van deze plant wordt, net als bij gember waaraan laos nauw verwant is, de rizoom (horizontaal lopende wortelstok die nieuwe uitlopers kan vormen) gebruikt. De smaak doet ook sterk aan gember denken.